Another suspected explosive is found in a construction site at Convention Avenue, Wanchai on January 31, 2018, after one was defused last week at the same location. 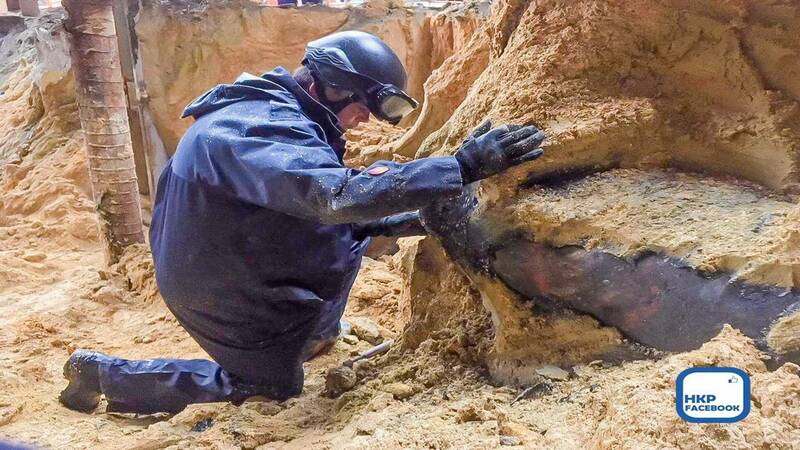 HONG KONG (CNN) - Hong Kong's explosive disposal unit has successfully defused a suspected World War II-era bomb found in a "dangerous condition" at a construction site in city's center, police said. It is the second unexploded device to be unearthed in the Chinese territory in a week. The new explosive was found at 11 a.m. local time Wednesday close to the harbor-front Hong Kong Convention Center and Exhibition Centre, near where a 450-kilogram (992-pound) bomb was defused Sunday. Authorities announced Thursday they had successfully disarmed the second bomb after a 24-hour operation. The discovery of the unexploded ordnance prompted police to close several roads and cordon off the area in the busy Wan Chai neighborhood, with shops shuttered and nearby walkways sealed off as disposal experts examined the device. Police said about 4,000 people were evacuated from the immediate area during the operation. Police said some cross-harbor ferry services were also suspended. Bomb disposal officer Alick McWhirter said the newly discovered device was the same type of bomb as the one found Sunday, but he said it would be harder to deal with due to a badly damaged fuse. "The bomb is in a dangerous condition, the fuse mechanism is severely damaged and the position of the bomb is making it difficult for our equipment to gain optimal access," he said. After the discovery of the first bomb Sunday, 1,500 people were evacuated from near the site and multiple roads closed before it was successfully defused the following day. According to US military archives, the US Army Air Corps began bombing Hong Kong when it was under Japanese occupation in the fall of 1942, striking the city dozens of times. Most of those air raids were carried out by B-24 and B-25 bombers, the former of which could carry up to 8,000 pounds of bombs. McWhirter confirmed the newly found bomb was of US design. An unexploded US-made World War II bomb also was discovered at a Hong Kong construction site last year and another in 2014, local media reported.